Feed Our Democracy is a movement dedicated to the notion that the backbone of any democracy is an active citizenry. Whether native born, naturalized, or self-identified, we believe it is every citizen’s duty to uphold the democratic ideals of freedom, justice, and equality. Our goal is to offer the inspiration and information necessary to turn each of us into citizen activists — one event at a time. We encourage people to expand their communities and uphold their ideals as they Meet, Eat and Activate. #FeedOurDemocracy was born out of our need to DO SOMETHING in the wake of the 2016 Presidential Election. We were horrified. We were stunned. So we marched. We posted. We ranted and raved. But we wanted to do something more. We wanted to keep on fighting for the democratic values we believed in, and we knew many of our friends did too. Nearly 200 people said yes. Nancy and Jeannine were two who didn’t just say yes, but said HELL, YES! I’M IN. And we three media-savvy women started to plan. We met with like-minded activists, we talked and talked. We planned, we schemed, we drank a fair amount of wine, and #FeedOurDemocracy was born. Welcome to the table. Welcome to change. Welcome to grass-roots, kitchen-table activism with a social media twist. We want #FeedOurDemocracy to feed your need to make a difference. Whether you’re raising funds for a candidate, raising awareness for a cause, or just raising hell when government doesn’t do what it’s supposed to – we’re here for you with resources, information, and a pretty nifty hashtag (if we do say so ourselves) so you can share your passion with like-minded activists around the country. 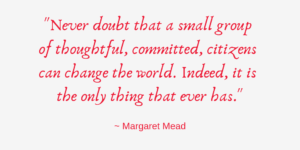 Small actions, taken together, yield big results. Join us, Meet, Eat, Activate and #FeedOurDemocracy.